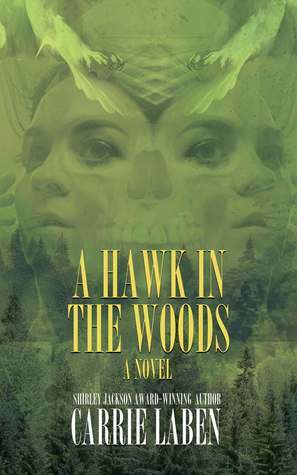 A Hawk in the Woods is a horror novel by Carrie Laben. 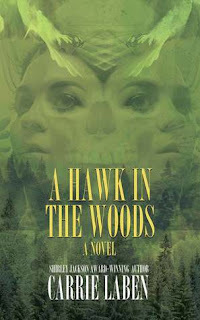 A Hawk in the Woods is told through two different timelines. After receiving a terminal diagnosis, Abby makes plans to bust her twin sister out of prison and head back to the cabin they grew up in. One timeline chronicles Abby and Martha's childhood growing up with a mother and grandfather who were heavily involved in witchcraft and the other follows Abby and Martha in the present on their road trip home. The multiple timelines in A Hawk in the Woods was really well done. The past and the present both managed to move the story forward, and I had trouble pulling myself away from either one. There are story elements in A Hawk in the Woods that I love but rarely get to talk about because they are almost always spoilers. This makes it very difficult to compare A Hawk in the Woods to other books I have enjoyed. Thankfully, A Hawk in the Woods can stand on its own as an excellent debut. I can't wait to read more from Carrie Laben in the future. If you enjoy family rooted witchcraft, you are going to want to pick this one up. You've sold me on this one. Gonna grab a copy soon. I tend to enjoy dual timelines, if done well, and that sounds to be the case in this one. Isn't it fun finding new authors? I love new authors to be excited about! Wow, this sounds great. I've seen this book floating around but didn't really know what it was about. Thanks for putting it on my radar!